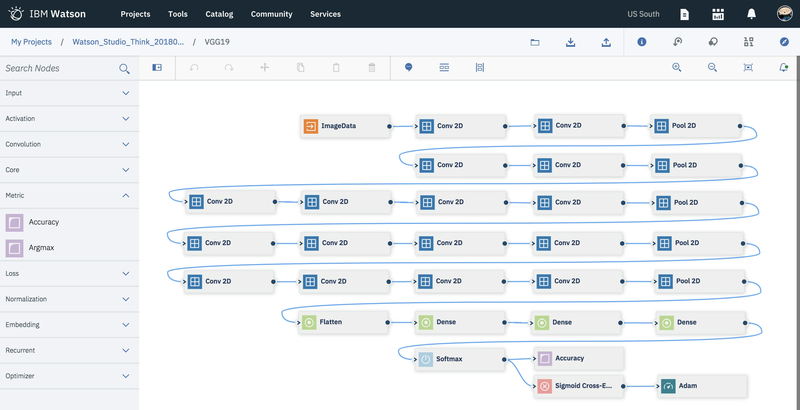 Design complex neural networks then experiment at scale to deploy optimized deep learning models, within Watson Studio. IBM’s experiment-centric deep learning service within Watson Studio allows data scientists to visually design their neural networks and scale out their training runs while auto-allocation means paying only for the resources utilized. Optimized for production environments, scale up your training using the NVIDIA® Tesla® V100 GPU with your preferred deep learning framework then easily deploy to the cloud or at the edge. Initiate and monitor batch training experiments then compare cross-model performance in real-time without worrying about log transfers and scripts to visualize results. You focus on designing your neural networks. We’ll manage and track your assets. Use your preferred deep learning framework: Tensorflow, Keras, PyTorch, Caffe and more. Manage your deep learning experiments with the tools you prefer: command-line interface (CLI), Python library or an interactive user interface. Train neural networks in parallel using market-leading NVIDIA® Tesla® GPUs - K80, P100, and V100. Pay only for what you use. Auto-allocation means no more remembering to shutdown your cloud training instances. No clusters or containers to manage. 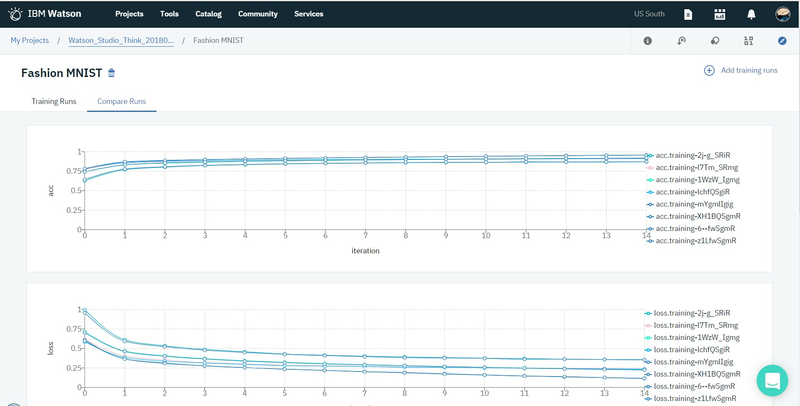 Efficiently automate searching your network’s hyperparameter space to ensure the best model performance with the fewest training runs. Visually design your neural networks. 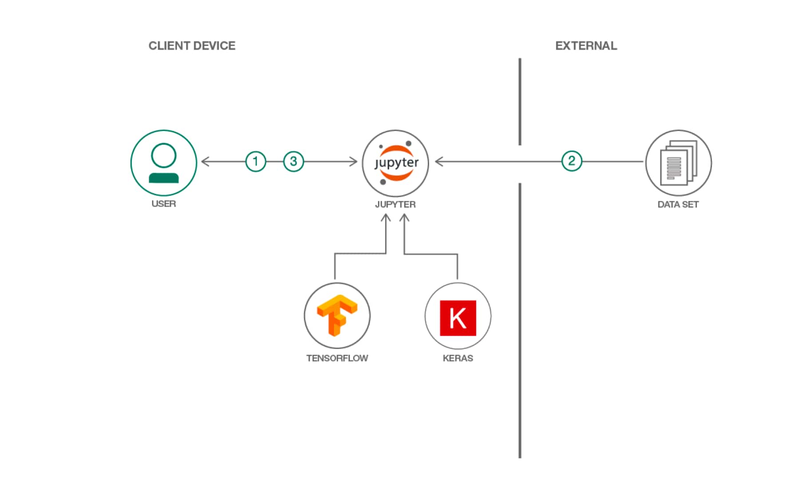 Drag-and-drop layers of your neural architecture then configure and deploy using the most popular deep learning frameworks. Not just money. Use your preferred IDE and existing workflows. CLI, python library, and REST access is balanced by visual debugging tools. Design and optimize your networks better and faster. Managed training means you focus on designing optimal neural network structures. Training assets are stored for you. Auto-allocation means you pay only for the compute resources required by the job. Optimized for enterprise production environments and running on the same infrastructure hosting IBM Watson’s own cognitive services. Forget text logs. Overlay accuracy and loss graphs in real-time, and track then view model hyperparameters to dive deeper into the training of your neural networks. 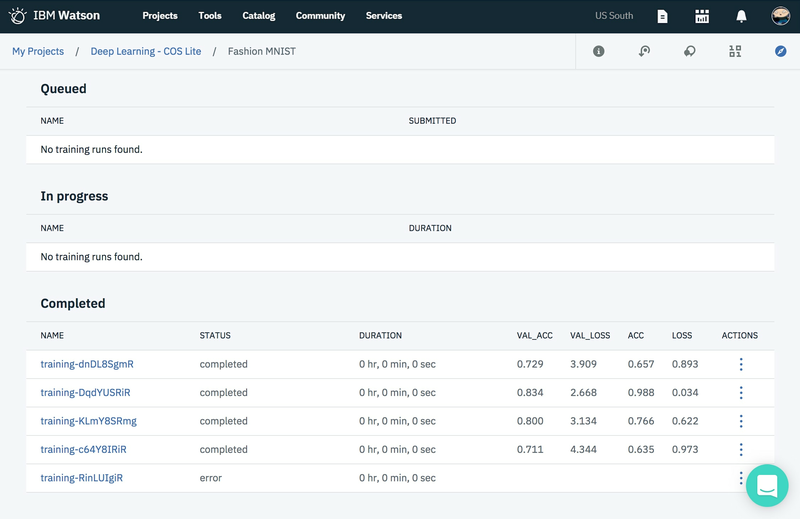 Share experiments, debug neural architectures, access common data within hosted object stores, and forward versioned models to your team then let them feed data into a continuous learning flow. How do you counter fraudulent issues such as product reviews? By using the same generative models that are creating them. This code pattern explains how to train a deep learning language model in a notebook using Keras and TensorFlow. Using downloaded data from Yelp, you’ll learn how to install TensorFlow and Keras, train a deep learning language model, and generate new restaurant reviews. While the scope of this code pattern is limited to an introduction to text generation, it provides a strong foundation for learning how to build a language model. Intelligent data and analytic asset discovery, cataloging and governance to fuel AI apps. Use your data to create, train, and deploy self-learning models. Leverage an automated, collaborative workflow to build intelligent applications. Get started or get scaling, faster, with a software distribution for machine learning running on the Enterprise Platform for AI: IBM Power Systems. On premises enterprise suite of data science tools, such as RStudio, Spark, Jupyter, and Zeppelin notebooks. Start executing your deep learning experiments now.